Monge surface a generatrix of which is an epicycloid with three cusps and the direction of the parallels of which is a horopter curve. Gaspard Monge (1746-1818): French mathematician. Other name: skew molding surface. and is the parametrization of any plane curve (the generatrix). The curvature lines are the generatrices and the parallels. The area of the portion of the surface delimited by two directrices and two generatrices is the product of the length of a portion of generatrix by the length of the curve described by the center of gravity of the portions of generatrices. The Monge surfaces are the surfaces that are the union of 2 by 2 parallel curves (called the parallels); notion not to be mistaken for the notion of translation surface where the curves are the translated images of one another. 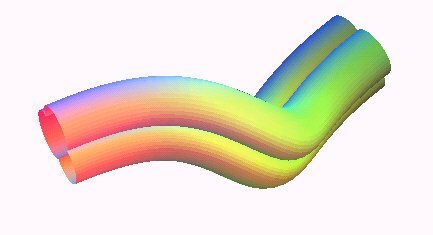 The orthogonal trajectories of these parallels are isometric plane curves, called generatrices; Monge surfaces are therefore Darboux surfaces. DEF 1: union of the curves parallel to a given curve (one of the parallels) and supported on another given curve. DEF 2: surface generated by the motion of a curve (the generatrix) on a plane all the points of which have a speed vector orthogonal to this plane; the points on the generatrix describe the parallels. DEF 3: surface generated by a plane curve (the generatrix) the plane of which rolls without slipping on a developable surface, called rolling surface (which is therefore the envelope of the plane containing the generatrix and the common polar developable of the parallels). DEF 4: Darboux surface the generatrices of which are planar and are also the curvature lines. More generally, when the parallels are planar (which is equivalent to the fact that the rolling surface is a cylinder), we get the molding surfaces. When the generatrices are linear, we get the developable surfaces; when they are circular, we get the tubular surfaces. Here is what happens if we take and instead of and in the definition above!